If you’ve grown up in Delhi (or Gurgaon), chances are you’ve found yourself at Appu Ghar at least once in the past. 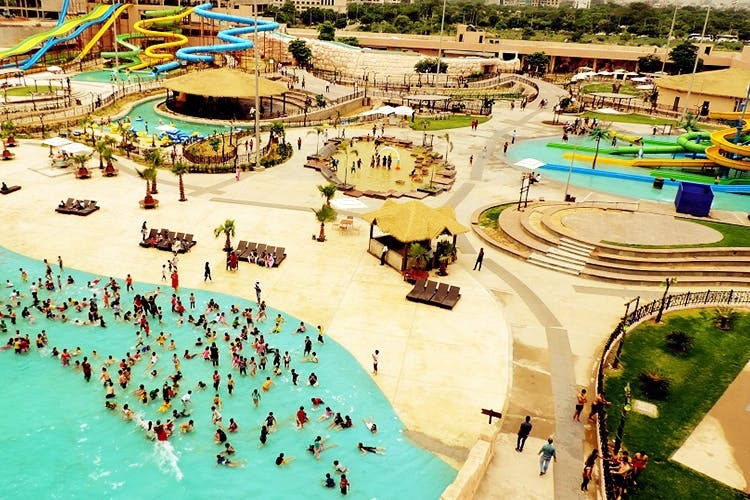 With a newer and better version that launched in 2014 as Oysters—a beach-themed water park, it is at a walkable distance from the Huda City metro station and has in store some crazy rides, like the Oh My Gurgaon and the Skyfall (that’s a steep 92-ft fall for all the adrenaline junkies). A fun place for people of all ages, the place also has enough food options like food courts, kiosks, a Low Tide restaurant that serves an array of world cuisines, and a High Tide bar. However, if you thought Appu Ghar was done being impressive—wait till you hear this. The place hosts multiple events, has an arcade centre, a spa for you to relax in as well as ample space to play outdoor sports like volleyball and tug-of-war. If that’s not enough reason to drive down, there is also the Appu Ghar Bakery & Ice Cream Parlour to satiate your sweet tooth. The ticket prices are pretty reasonable—in exchange for all the entertainment you’ll get. They start at INR 1,200 (but we’d recommend that you call them up and ask about the latest discounts and updated rates). Delhi folks, it might be a bit of a drive for you if you're planning on going here. Also, do try to avoid the weekends since the rush is higher and you might have to wait your turn for the rides for longer.